The painted suitcase and to train cases I purchased from lady Anne are simply stunning. The painted details on the outside as well as the beautiful fabric and pictures inside the cases are true works of art. I will cherish and enjoy them. The pillow is lovely. The teacup and roses fabric is the perfect background for the sweet graphic of two friends enjoying a cup of tea and the vintage buttons. Thank you for including the pretty Victorian purse. Thank you Lady Anne for another special purchase. I just LOVE my Easter eggs! They are beautiful and make a wonderful addition to my vintage Easter collection! I am in love with the Easter Pretties I bought from Lady Anne. The large and small Easter eggs are beautifully made and detailed. The bright yellow chick is stunning. As always my purchases were carefully wrapped and packed. I love my Victorian valentine heart so beautiful.I also purchased the Easter Victorian style eggs. They are so sweet and precious. styles for you. You will love them. Fast shipping and packed with her special touches so sweet. My two recent purchases from Lady Anne are stunning. The Santa's and tree were a beautiful addition to my pink Christmas. My recent purchase from Lady Anne included 2 cake stands with beautifully designed and decorated cakes., and a tea vignette. I continue to be impressed by Lady's Anne's the beautiful art she creates. I look forward to decorating my house with her art. Simply gorgeous! Such creativity and a keen eye for detail. Lady Anne is the Best of the Best! Can't wait to see what's next. The recent order I received from Lady Anne is simply beautiful. From the cherub and pink tea cup candle cups, Easter music box, painted rose covered cake stand to the 2 pink and cherub cake and Bon bon stands the detail and workmanship is amazing. The same attention is evident in how each piece was wrapped and packed. These pieces will be displayed and treasured for many years. Thank you for another wonderful purchase. Simply stunning! I ordered a train case and Pink Santa. I could not believe how beautiful they are. The workmanship and details are incredible. The same attention to detail carried over to the packing and shipping. I ordered two more of the pink Santas and they too are stunning. What a talented artist. OMG- when I opened the box, I was so excited!! My Santa was wrapped with such care and the Christmas tree was WOW!! My home is so pinkly beautiful during the holidays-- just peaceful. Absolutely beautiful. I have purchased several beautiful items from Ladyanne,two of the beautiful pink books and a music box.They are not only exquisite but very well made. I am so happy to have found this delightful site!!! I just received one of Lady Ann Roses" beautiful train cases and teapot and they are absolutely exquisite! I love hand painted roses and feel honored to have such beautiful work grace my home. Thank you! 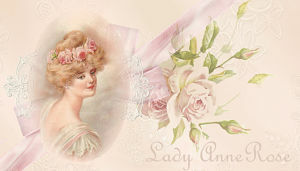 I have bought many items from Lady Anne Rose and each one has been more beautiful than the next. My walls in my home are full of the beautiful ladies pictures and truly has transformed my home into my Victorian dreamhome.